If Nostalgia Is a Desire, What Does It Long For? When we’re not using nostalgia as a term of derision, we use it to name a twinge in the gut that somehow blends melancholic longing with happy recollection. When this experience becomes acute it may best be described, pardon the unseemly melodrama, as an ache in the soul, but one that is not without its consolations. But first, about that derisiveness. Nostalgia is a fighting word. For instance, one of the easiest ways to dismiss a claim is to label it nostalgic. This is why, in fact, I’m thinking of adding “knee-jerk recourse to nostalgia as a term of derision” to the list of Borg Complex symptoms. No doubt, much of what gets labeled nostalgic should be dismissed, although perhaps not simply by attaching a label to it. At best, then, we allow ourselves to indulge in the distractions of nostalgia–a little Mad Men, a little Downton–so long as we maintain the appropriate degree of ironic detachment. I remain curious, though, about the feeling itself and what evokes it. It is one thing to critically analyze the commodification of nostalgia and its deployment as a marketing tool, for example, and it is another thing to contemplate that moment when we experience the feeling we label nostalgia, particularly in its more acute manifestations, and seek its sources. 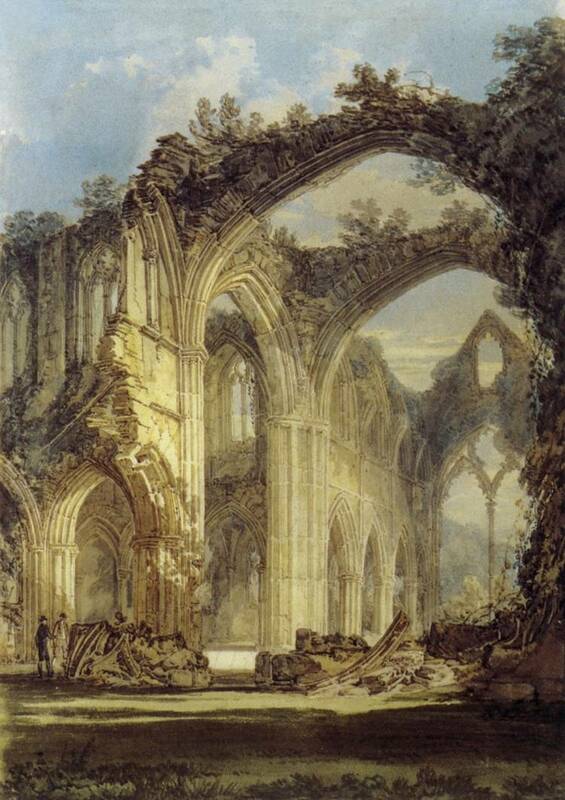 Tintern Abbey, JMW Turner, 1794. Wikimedia Commons. Part of what puzzles me about such experiences is how difficult it is , for me at least, to define what exactly one is feeling. But before I go any further, it might be useful for you to recall for yourself a time when you experienced nostalgia. I don’t assume that everyone has had such an experience, but, if you have, try to hold that moment in mind and think with me about how we might understand it. Here are a few lightly structured thoughts toward that end. The thing that arouses nostalgia is a synecdoche for the past and a signal of our dislocation; it is a reminder of our finitude, for we cannot horde time. and continues by describing the place around the abbey. It would be hard to abstract, in more than a theoretical way, the aspects of time and place from Wordsworth’s nostalgic meditations. Maybe it is really neither place nor time that is the essence of the experience of nostalgia. Maybe place and time have been proxies for some other object of desire whose presence radiates from them and through our memory to us. Nostalgia, then, is just another word for desire, or, perhaps better, it is one of the shapes desire takes. That’s what gives it its ache-in-the-soul quality. But what is it a longing for, if not for a time or for a place? I am scattered through time, as are you. One way of thinking about the divided, de-centered, shattered self is to see it as a temporal phenomenon, as a function of our time-stretched nature. I have been; I am; I will be. The self may feel most coherent in the present moment, on the leading edge of time, but it is scattered throughout the past. We can imagine it as a boat and its wake. Seen from above, the wake is widest, and most diffuse, at its farthest from the boat. We are that boat making its way inexorably onward on the sea of time, but we are also the wake with the detritus of the self strewn upon it. Nostalgia, from this perspective, is a desire for the self, for self-possession, for all of the selves we have been. The desire is kindled when our present self tunes in to traces of our past self. That tuning might be occasioned by an object, an image, a melody, a smell, and, yes, a place. But it is not any of those things which we desire, it is that part of our self that existed with them. The objects and experiences that evoke nostalgia are synecdoches not for a time but for the self. Nostalgia then is ultimately a desire for wholeness. It is a desire to horde, not time, but rather the fullness of our self, scattered across time; a desire to lose nothing of our selves, to hold, at once, all that we have been. That, of course, is an impossible object of desire, which is why nostalgia vocalized is a sigh.